So its been two whole weeks since THE PATCH, the world didnt end and we all survived. Things have calmed down a little (unless you play a ret paladin) but I admit to being a little undecided about some of the changes. The cower animations: particularly the female nelf and druid treeform ones. I fully intend spending all my time afk cowering at something, this seems particularly appropriate given the impending rise of the Lich King. Shadowmeld: when I first saw the proposed changes to my precious shadowmeld, I admit to panicking. How was I going to cope without my shadowmeld & drink macro, obviously the whole world was going to explode and I suddenly wasnt going to be able to drink in pvp (ignoring the fact that both my draenei paladin and shaman manage just fine without shadowmeld). Then I took a deep breath and calmed down to consider the possibilities. Having tested it in some pvp since the patch.. the new shadowmeld rocks and is bound to get nerfed. Its wonderful and makes up for losing starshards completely. Crews on Boats: I like the world to feel lived in. Having people wander around doing their thing makes it all feel so much more alive. Some improvements could be made however, maybe a ship’s cat minipet or some form of unique to the highseas beverages/food buff. I love the way the story is evolving. The Argent Dawn showing up again in all the major cities, the fact that the Lich King is already starting to make his presence known with his servants whispering into our minds, telling us our fears, threatening our loved ones. I want my characters to have a reason to head off to Northrend and it seems that we will indeed get that. New Talents: Recently specced Disc again to experiment with the new talents and im loving it. Shame penance isnt selfcastable, but I love the fact that its instant, can do damage and has a great graphic. Also enjoying Divine Aegis, especially now prayer of mending can crit. The fact that its a perfect bouncy bubble just adds to its perfection really. Haven’t done a huge amount of pvp since the patch, but I managed to survive a rogue on me whilst helping a lv 67 2 man Tuskar, we killed the rogue, then Tuskar with no real issues. I certainly do not feel like a free kill unless Im being zerged by 4 or 5 people and then lets face it, everyone is a free kill under those circumstances. Achievements: Whilst Im not falling over myself to complete these, their addition to the game has netted me over 5000g since the patch came out in sales of runecloth to my own faction (all after the Ambassador title) and in sales of mini pets and cooking recipes to the opposing faction. I admit to ticking off certain achievements, but I refuse to play my game differently just so I can “achieve” something. If for example, I am already in a zone doing something and I notice that I havent uncovered all the map, I might take 5 minutes to do so, but Im not flying somewhere just for achievements. I do however like the fact that people hungry for warbears have started organising lots and lots of city raids. Decreased Level time to 70: We really werent sure that the Gnomeling would succeed in getting a warrior to 70 before the expansion hit but as it turned out we had weeks to spare. Mounts and Booty Bay: Its always annoyed me that you couldnt ride in Booty Bay and finally they have fixed it, must have strengthened the dock or something. 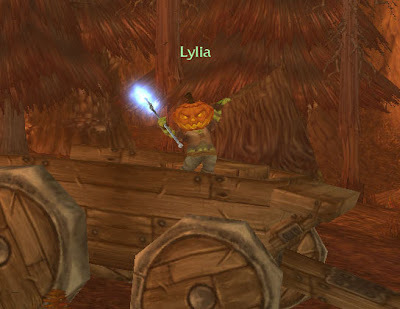 You can also ride though the Inn in Moonglade and all those other spots that looked mountable but werent. 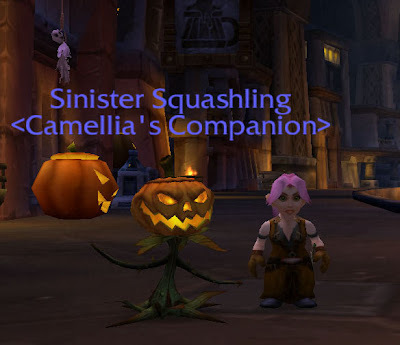 You can now get Sinister Squashlings from the treat bags, as well as a drop from the Headless Horseman, so even my lv 8 rogue has managed to lay her mitts on one. Whilst im glad they made them easier to obtain, I do think 2 squashlings and 2 hallowed helms in 2 hours seems a bit too easy. So over all, Im now at 3 squashlings, 2 from treat bags and 1 from the Horseman. The gnomeling hit the Outlands this morning, in record time for us. Looks like he will make the deadline of being 70 before the expansion hits, something we really werent sure of when we started. Here he can be seen in his true colours, a lepergnome with a pumpkin head. On a side note, the achievement for popping a pumpkin on the head of every race almost killed me this morning, Horde throwing things at you is scary. In other news, Mariposa finally got an epic flying mount. Thanks in part to all the people willing to pay crazy amounts of gold for runecloth. 9 gold for 20 makes it a very expensive way to rep farm. The festival of Hallows End has begun. 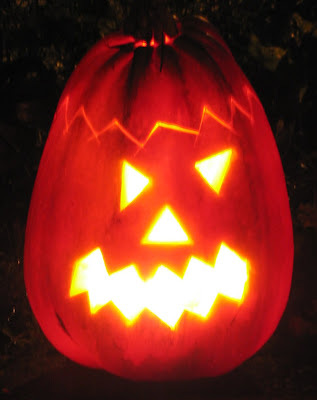 My favourite festival of all, I love the pumpkins that suddenly appeared glowing all over the cities. The paper skeletons hanging on cupboard doors, the fact that we are actively encouraged to eat candy and that we get to save the world from the Headless Horseman (an evil doer that gave me nightmares as a child – yes I have an over active imagination, Scooby Doo versus the Headless Horseman gave me wakeless nights for weeks. Although I saw it again recently and couldnt quite figure out what spooked me all those years ago. Sleepy Hollow remains a movie that chills me though, I still cant properly watch the scene with the little boy under the floor boards). So far Ive turned into a ghost, eaten a lot of sweeties and done some trick or treating. Happy Hallows End. 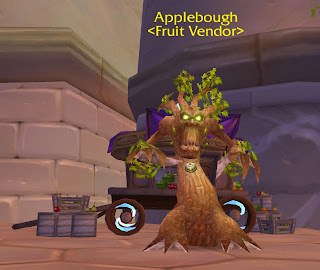 One question keeps bugging me, I can only think of two spots in Azeroth where pumpkins grow. The Brackwell Pumpkin Patch in Ellwyn Forest and that field in the Tirisfal Glades. So how did these two fields, produce so many giant pumpkins? There is obviously something dodgy going on somewhere. With the expansion coming soon and all that, Ive changed my header. The troll village is so 2006 really, so its been replaced with the frozen North.